For as long as I can remember, really, I’ve loved Philosophy. The brand has always spoken to me, both because of the quality of the products and the you-won’t-find-it-anywhere-else packaging. Philosophy is even a brand that my close family and friends have all adopted as one of their favorites, too! My mom, brother and best friend all use the products just as religiously as I do. These are just a few of the products I can’t live without. My mom, brother, best friend and I are all especially drawn to Philosophy’s signature 3-in-1s. Maybe it’s the recipes on the front of the bottles. Maybe it’s the fact that the huge bottles last for what seems like FOREVER. Or maybe it’s just because of the delectable, delicious, totally decadent scents, like Senorita Margarita and my favorite Philosophy Vanilla Birthday Cake. One thing’s for certain: my shower isn’t complete without them. There are way too many nights where I’m WAY too lazy to wash my face. Luckily, these cleansing wipes make having clean skin, well, simple! I love the fresh scent and the fact that they don’t strip my skin or feel rough to the touch. I’ve bought them way too many times to count! This gel-cream moisturizer is perfect for hot, sticky summer months. It’s light and refreshing, it sinks immediately into the skin and it just leaves behind the most beautiful glow. I use this lotion every single night before climbing into bed. It’s the only one I’ve found that isn’t too heavily perfumed and leaves my skin feeling super soft and smooth. Plus, the whipped texture is just like dipping your hands into a vat of creamy butter. Sunday, July 28 at 7pm EST: The last show! Throughout these shows, Philosophy and QVC will be offering some of Philosophy’s bestsellers and most loved products in special sizes and at special prices. You can find everything from Purity Made Simple and Hope In A Jar to a trio of Amazing Grace Whipped Body Cremes and a divine Tropical Getaways Shower Gel Trio. You can watch the shows on TV, of course, but you can also stream them right from your laptop or tablet from qvc.com. Pretty cool, right? 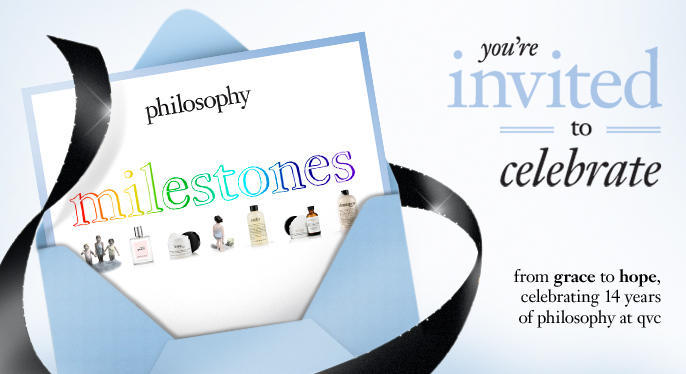 And, of course, you can purchase so many fabulous Philosophy products on qvc.com as well. I’ll be live tweeting as many of the events as humanly possible, so be sure to follow me on Twitter. Your only caveat? Beating me to ordering everything in sight!